Many people will be surprised that diving is a very specialized discipline. While every diver begins with the Open Water (OW) Scuba certification, there are several different specialization courses a certified diver may take from there. This certification is the basis of all advanced diving courses and is meant for anyone interested in underwater exploration. A diver who holds this certification will be able to go on open water dives around the world in conditions that are similar to their training, and continue on to advanced specialty courses. To take an OW course, students will demonstrate sound judgment in the dive planning and execution, complete an OW knowledge course, and complete all requirements safely and efficiently. OW courses cover all the necessary diving skills and knowledge, including: the aquatic environment; physics and physiology; dive equipment selection, assembly, use, and maintenance; dive planning; basic scuba skills; and more. They are quite interesting. WANT TO GET STARTED? CLICK HERE TO FIND YOUR NEAREST DIVE STORE! Once one has earned an OW certification, things begin to open up. From here, divers will likely choose to take the Advanced OW course. This course offers a number of benefits that will attract most divers. Diving experience with supervision. New divers may feel a little nervous about diving, even after becoming an OW diver. By providing divers with additional experience under supervision, divers can continue to receive feedback and improve their skills in a safe environment. An introduction to safety skills used in advanced diving. A good advanced OW course introduces students to various types of recreational diving, including: deep diving, night diving, underwater navigation, boat diving, drift diving, multi-level diving, etc. The chance to try even more advanced certifications. Most advanced OW courses will include an elective system, allowing divers to try a specialty course like underwater photography, fish identification and biology, hunting and collection, underwater archeology, and wreck diving. Taking these electives will count toward these course requirements. Every course will have a different approach to education. Some might focus on academic performance, while others will focus more on performance in the water. While the choice will be largely preferential, be sure that the course will transfer its skills effectively. Once a diver has passed an advanced OW course, there are all kinds of specialties to choose from. Some of the advanced courses are more advanced versions of essential skills, while others are entirely up the individual. Rescue: This training teaches students about common diving accidents, how to prevent them, and how to manage them if they occur. The course is commonly known as “Stress and Rescue,” because it demonstrates the signs of anxiety in oneself and one’s partner, and what steps to take when it happens. Navigation: A navigation class will teach both compass use and natural methods such as reading currents and the bottom contour of shadows to keep track of one’s position. Deep Diving: Even though there is no formal depth limit for an Open-water certification, it is generally considered to be 60 feet. Divers who wish to go even deeper will deal with additional factors like air management, nitrogen narcosis, and decompression sickness. Night and Low-Visibility Diving: Night diving involves the use of new types of equipment not covered in previous training. Additionally, divers must learn to handle communication issues, orientation, and nocturnal animals. Boat Diving: These courses will cover exiting and re-entering the boat; boat operation and terminology; and dive boat customs and etiquette. Underwater Naturalist: This training goes by other names, including Fish Identification and Underwater Ecology. 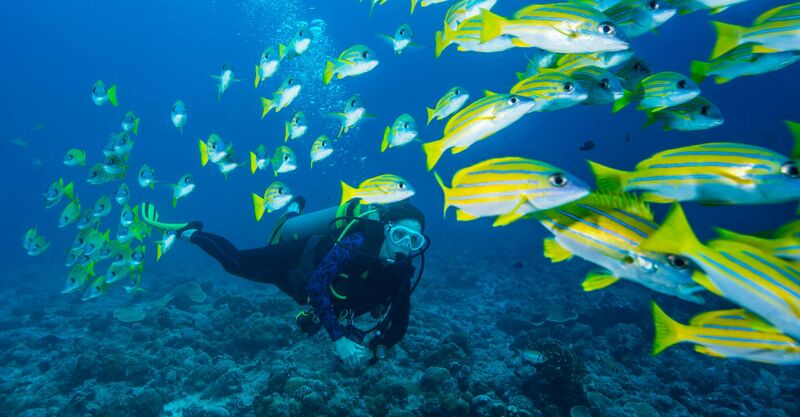 These courses serve to deepen one’s understanding of the marine environment and make diving even more interesting. Search and Recovery: These courses teach divers skills like how to recover an outboard motor. They can improve a diver’s navigation, buoyancy control, and awareness. Underwater Photography: Underwater photography is very popular among divers. An underwater photography course will teach divers improved buoyancy control and the knowledge needed to get up close with marine life. Current Diving: This is a great course for almost any diver, since it covers drift diving and live-boat diving, which most divers are likely to encounter. The course mainly teaches about navigation, currents, surge, and wave action. Wreck Diving: This course teaches essential skills for navigating a wreck, including orienting yourself when navigating a wreck, avoiding silt and low-vis problems, etc. Diving is actually a far more specialized and diverse activity than most people realize. Of course, there are even more specializations in the technical diving area, with fewer people opting for those types of dives. But for most divers, learning skills like night diving, navigating wrecks, and the other skills listed here are more than sufficient. And it’s fun. For more information on scuba diving and equipment, visit Dive Training Magazine.